In this section we will discuss what an Operating System or OS is. 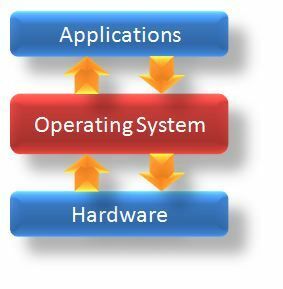 We will look at the types of operating systems and briefly discuss each of these. For more detailed information please have a look at the links at the bottom of the page. The OS is a very important piece of software. Without it your PC is just a heavy, overpriced door stop. When you initially switch on your computer, the system runs the BIOS (Basic Input Output System) checks to determine if the hardware is fine before it hands over to the OS. The BIOS in itself is a sort of OS that sits on specialized hardware on the motherboard. The BIOS is responsible for checking the hardware and configuring the system prior to booting the OS. After the BIOS is finished, it passes control over to the OS. The OS runs between the hardware and the user applications. Applications being, software programs such as Microsoft Word or games. The OS is responsible for managing the operation of the system. It manages the memory, hard disks and other components via drivers that are loaded. It interrupts processes and allows other processes to continue while this process is waiting. As you can see there's a lot of stuff that happens behind the scenes. Before you can run any software on your PC, you need to first install the OS. Sometimes it comes pre-installed, sometimes you have to install it yourself. I personally like to install my system fresh, even if it comes pre-installed. I can then organize things the way I like it. The core of any OS is a thing called the kernel. Some refer to it as the registry. I just call it the kernel. It's also part of the OS and is loaded in memory and stays there until you switch your system off. It directly controls hardware resources and manages memory, virtual memory and various other processes, that's essential in the operation of your computer. That's all great, but what types of operating systems do you get? Most people will answer you and say there's only one, Microsoft Windows. But fortunately Windows is not the only OS out there. Operating Systems are not just found on computers. They are also widely used in cellphones, car computers etc. If the device has some kind of processor, it will run some kind of OS. Let's look at some of mainstream OS's first. The Microsoft Windows family of OS's is probably the most popular. Millions of people all over the world use windows. It runs on mostly Intel and AMD processors. Another popular OS is Mac OS developed by Apple. This OS only runs on Apple Mac computers. This type of OS is called a proprietary OS. Because it only runs on Apple Mac, the manufacturers can create their own custom drivers and kernel to run on their specific hardware only. This makes the Mac Os very stable. It comes at a price though. Apple computers are usually more expensive than most mainstream PC's and laptops. UNIX is mostly used in server environments. It's well suited to multitasking environments, which means it can do a lot of tasks at the same time. Vendors like Sun Microsystems, now Oracle Sun, IBM and HP have their own versions of UNIX that they run exclusively on their platforms. Oracle Sun have a UNIX versions called, Solaris and runs on their servers commonly know as, SPARC servers. IBM have AIX that runs on their P series. HP has HP-UX that runs on their UNIX servers. Linux is very similar to UNIX and can be installed on Intel or AMD processors. It's also commonly used in server environments because of it's multitasking capabilities. Some versions of Linux can even be run on proprietary system like Oracle Sun's SPARC Servers. There are lots of different Linux versions out there. Some of the more common ones are, Red Hat, SuSe Linux and Ubuntu. There are some other versions as well, but these are more common ones. The reason why Linux is so popular is the fact that it's free and is maintained by a community of people all over the world. There are other operating systems for mainframes, cellphones, hand held game consoles etc. Well, it depends on what you want to do. If you use your PC or laptop for web browsing, email, games and some word processing stuff, then Windows or Mac Os is probably the way to go. Windows is easy to install and use. There are also lots of applications written for windows and there's lots of help on the net. If you want something more specialized such as graphics and sound work, then a Apple computer might be the way to go. Some music producers swear by a Mac and will not use anything else. People who do websites and graphics also believe a Mac is the way to go. I had a music studio myself and I did not have the money for a Mac. I bought myself a decent PC and created 3 music albums with it. I cannot tell you which is the best, Mac Os or Windows. They both have their strengths and weaknesses. Go to a PC shop and play a bit with both and see which one you like. Try to get input from people who are using both Mac and PC. If you are a novice PC user I can definitely suggest that you don't use Linux or UNIX on your PC. These can be hard to learn and you could get totally lost and frustrated by its complexity. After you feel comfortable with PC's and windows then nothing stops you from giving Linux a try. If you don't like it, go back to what you feel comfortable with. The best way to learn something is to actually work with it.